(CBS) - The thousands of heavily armed law enforcement officers and scores of military-style tactical vehicles amassed around Boston Friday might have looked chaotic to many watching the hunt for Boston Marathon bombing suspect Dzhokhar Tsarnaev unfold on television. But the man who heads the LAPD's counter terrorism and special operations bureau says the city-wide lockdown makes perfect sense. "He's unpredictable, he's heavily armed, and he knows how to use explosives," said the Deputy Chief Michael Downing. Downing, who participated in the massive February manhunt for former LAPD officer Christopher Dorner, told CBS News' Crimesider that the first order of business when a dangerous person is on the loose is to keep innocent people safe while preserving the ability to engage with the suspect if they appear. 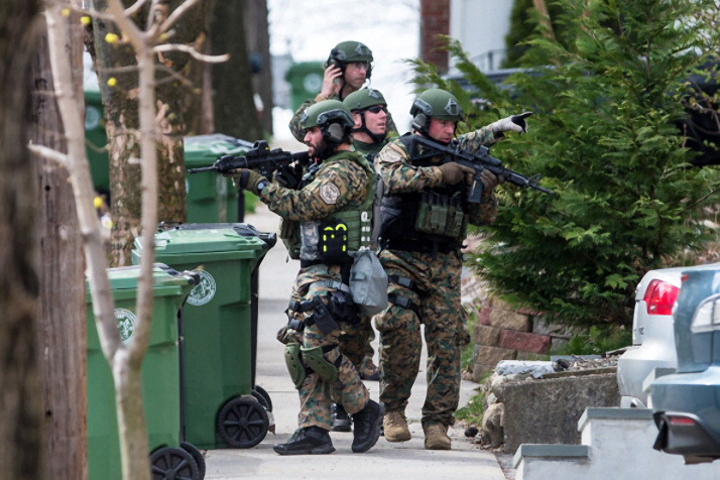 That, he says, explains why Massachusetts Governor Deval Patrick issued a city-wide lockdown, asking Boston residents not to leave their homes and pushing media back further and further from the action unfolding as police search door-to-door for 19-year-old Dzhokhar Tsarnaev, who the FBI has said should be considered armed and extremely dangerous. Maria Haberfeld, a professor of criminal justice at John Jay College of Justice in New York City, had a slightly different interpretation of the overwhelming law enforcement presence that has shut down the streets of Boston. "I think the display of police power is more to calm the public than out of operational necessity," said Haberfeld. "But you can't keep a city like that locked down too long. People need to go about their business." She adds that law enforcement should be mindful about how their mobilization could potentially "glorify" the man they are seeking: "One individual can't have the power to shut down an entire city." Over the past decade, local and federal police agencies have been training to deal with situations involving terrorists, amassing weapons of war - such as the tank-like tactical vehicles currently rolling through the streets of Boston - and preparing to work together should the situation arise. This week, it did. According to Haberfeld, the massive show of force in Boston represents the first major field test of the interagency task forces created in the wake of the September 2001 attacks. Currently on the scene in Boston are officers and vehicles belonging to the FBI, the Bureau of Alcohol, Tobacco and Firearms, the Department of Homeland Security and the National Guard. The Boston and Watertown Police departments, as well as the Massachusetts State Police, are also involved. Additionally, the FAA has instituted flight restrictions in the area and Amtrak service has been suspended. Both Downing and Haberfeld said that the FBI, through its Joint Terrorism Task Force, is likely the agency calling the shots. But Haberfeld said that when Tsarnaeva is found, the action will likely "boil down to the personalities of the police who get there first." Whether they are local police department tactical units or federal agents, "their adrenaline will take over the larger picture."